My story begins with my best friend and the strongest woman I know.....My Mother, Amy Zibura. 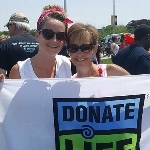 My mom is a kidney transplant survivor times two. And we are lucky enough that " Tucker" her second kidney has been with our family for 14 years now. Not only is my mother a Kidney Transplant Patient but she was also a dedicated Renal Transplant Nurse for many years at Albany Medical Center. She brought comfort, hope , laughter and compassion to those who were experiencing Dialysis, Transplants, Loss of their Transplants , and many other health conditions. She was able to relate with the patients and share her experience with them as they shared theirs with my mother. At one point I was a Nursing Aide on the Renal Transplant Unit as well and my mother and I were known as the " Mother/ Daughter Tag Team" hahah, I know...I am pretty cheesy. But the experience of working with my mother and watching her be an amazing Nurse, the chance to work with patients and families, to watch them with their new gift of life, to work with such amazing Doctors, Nurses and Staff on the Renal Transplant Unit that felt like family.....all of that....will always hold a special place in my mind and my heart. About 3 years ago now my mother suffered from a Brain Aneurysm and Stroke. The recovery process for her and my family was very hard but luckily " Tucker " has held on strong and has put up a great fight just like my mother. I am forever grateful for Tucker and what he has brought to my family. I think of how hard my mom has worked. How courageous she is. I think of all the patients and families I have met along my years and how hard they have worked and how courageous they are as well. They have all taught me so much about life and the meaning of life...and for that I am grateful for as well.